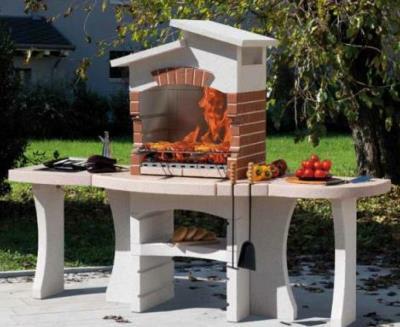 Natural coloured barbecue made of white marble granulate. Peach-coloured worktop in high quality crystal polished marble finishing. 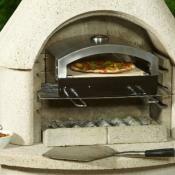 The barbecue has an integrated rotisserie spit holder and comes complete "Easy Fire" aluminium alloy plate for easy fire lighting. 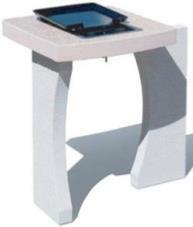 Interchangeable side tables made of white marble granulate with peach-coloured worktop. 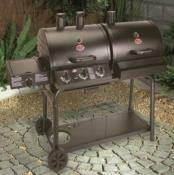 One side table includes a gas cooking unit and a cast-iron griddle plate. Side table includes a gas cooking unit. 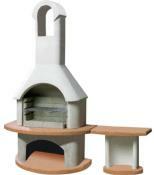 Cooking area 60 x 40cm adjustable on 3 levels.